Take an illuminated drive along the Chesapeake Bay in the yearly holiday tradition called “Lights on the Bay” at Sandy Point State Park. More than 60 spectacular animated and stationary displays light up the roadway every year. 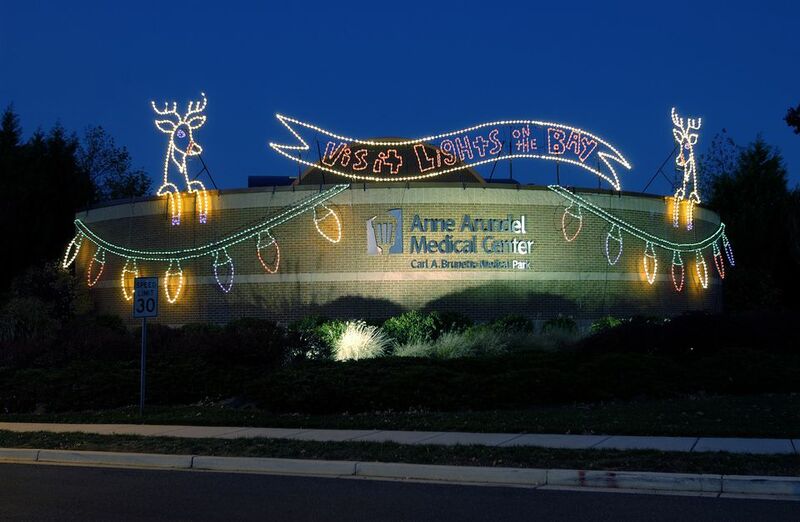 The Christmas light show is sponsored by the SPCA of Anne Arundel County. In addition to popular classic holiday displays, visitors enjoy a colonial village inspired by historic Annapolis and one of the USNA midshipmen tossing their hats in the air. Guests are also treated to scenes from the North Pole Village and Enchanted Fairy Tales. You can even purchase 3-D glasses to add to the experience too. November 17, 2018-January 1, 2019, 5-10 p.m.
Sandy Point State Park - Route 50, at exit 32, near the Bay Bridge in Annapolis, Maryland. (410) 481-3161. From Washington, D.C.: Follow Route 50 East to exit 32. Follow the signs to Sandy Point State Park. From Baltimore: Follow I-695 to exit 4 for Route 97 South toward Annapolis. Exit off of Route 97 at Route 50 East. Take exit 32. Follow the signs to Sandy Point State Park—just prior to the Chesapeake Bay Bridge. From the Eastern Shore: Follow Route 301 South to Route 50 West. Cross the Chesapeake Bay Bridge to exit 32. Follow the signs to Sandy Point State Park. $15 per car. Several area businesses and publications offer $2 discount coupons, including The Baltimore Sun, Pennysaver, The Capital newspaper, Anne Arundel County public libraries, Graul’s Markets, Annapolis Subaru, and Red Hot & Blue Restaurant. The coupons may be used Monday-Thursday, except holidays. Lights and Leashes - Walk the light display with your dog on November 15, then enjoy refreshments, pet related merchandise, and of course, many adoptable animals. Dashing Through The Show - Race begins at 6:15 p.m. on November 16 AAMC & The Annapolis Strides host the annual 5K Fun Run. Advanced parking/ticket required. Military & First Responders Night - On December 7, admission is $5 for Military/First Responder Admission per car (must present a valid ID to receive discount). Ugly Sweater Night - Wear your “ugly holiday” sweater for a special discount of $10.00 per car on December 9. Graul’s Market Night - Spend over $100 at Graul’s Market and bring in your receipt for $5.00 off your admission on December 2.